Several weeks ago I turned in the last version of ACORAS (the sleeping beauty retelling) back to my agent. This recent revision was particularly hard for me. I completed initial revisions in 8 days (8 DAYS!) and then had a series of unfortunate events relating to critique partners, which delayed the Official Turning In by several weeks. Then I had a new CP read the book, someone whose opinion I admire very much, and she pointed out a very serious flaw: the ending doesn’t… really… work. To be fair, I wrote the original ending in a furious burst of 10k two years ago in an effort to finish the story and be done with it. And it was an okay ending. But it wasn’t really amazing, and it didn’t fully wrap up some of the themes in the book. So, okay, I need a new ending. I wish I’d gained enough wisdom from the experience to do a separate blog post about How to Write a Great Ending, but it all boiled down to lessons I’ve learned before: Kill your darlings. Brainstorm until it hurts. Write. Even after it all got wrapped up and turned in, I still struggled with insecurity. There were a couple things I had to change in the book in order to comfortably do what I wanted in the second book, and I was nervous my agent would say I hadn’t pulled it off. But I had to set that aside, because my BFF Amber was coming to visit for a week! Chris and I worked for months on redoing the guest bedroom and decorating it, which led to this lovely piece of work on my craft blog, which I am giving serious consideration to retitling ‘Hate-Crafting’ because I loathe crafting these days. It’s like I gave all my patience to writing-related things and now I have none in other areas. Then Amber arrived. 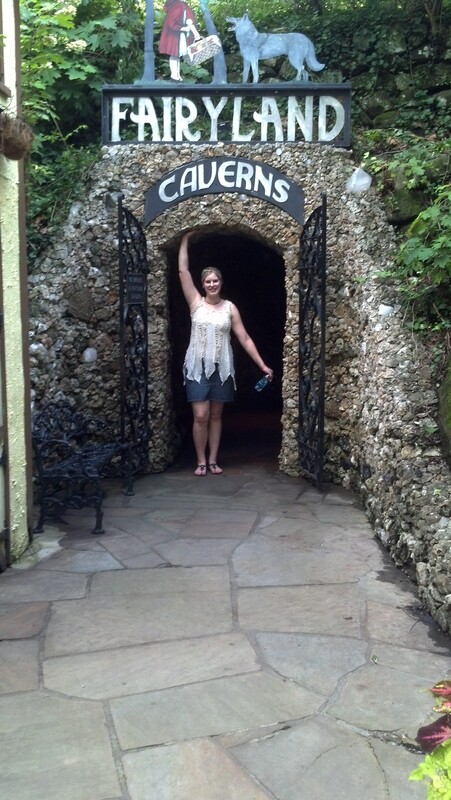 And we did amazing things, like visit Cathedral Caverns, tour Rock City (the setting of the climax of Neil Gaiman’s American Gods! ), watched American Horror Story season 2, rode horses, and some other things probably only the two of us would think are awesome, so I won’t bore it with you here. And then, while she was here, my agent got back to me with news so happy I teared up: I did it. All the changes I made, including the ending, totally worked and the character issues were fixed, and now I can do what I wanted to do with the second book. 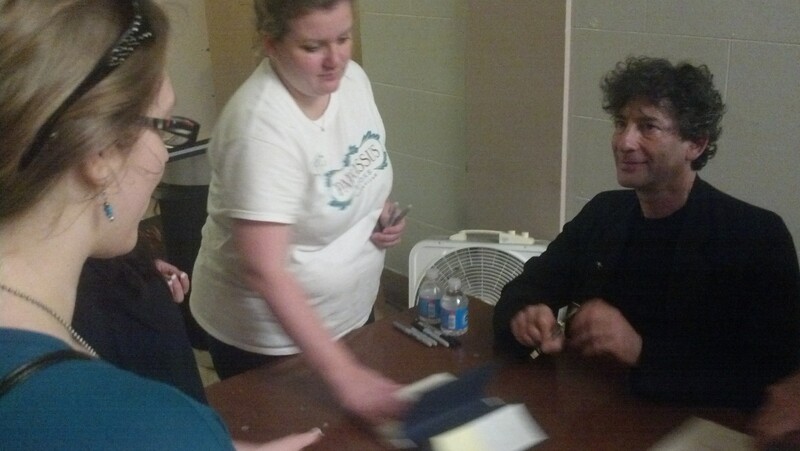 Oh yeah, and Amber and I met Neil Gaiman. So let me set the scene for you: 1700 people waited in line outside the capitol building of Nashville in mid-80-degree heat. We finally got inside and miraculously all those people fit in the auditorium. Amber and I were joined by my friend Eleni McKnight, who brought us a giant bag of delicious Greek cookies. Which I continued to eat for a week because I love cookies. Neil was charming, hilarious, and relateable. He told an amazing story about how the book came to be formed, which included the line, “I called up to my editors and I said, ‘I don’t know how it happened, but I seem to have written a novel. I’m so sorry, it will never happen again. '” Which really made me want an inside peek into his career/marketing plan. He also told a lovely anecdote about how personal the book was to him, and how it related to his wife, Amanda Palmer. Then the signing began. To make it fair they pulled numbers out of a hat, and if your row was called you were able to get into the line. When the line died down they’d pull more numbers. It took us 4 hours for our row to be called. Amber and I had a 2-hour drive home so I was getting particularly antsy, but it was all worth it once we got to the front. Neil said I had a beautiful name, so point one for me. I told him I was a writer, then I told him a secret. He shook my hand, and wrote WRITE! in my book, where his usual schtick is to write DREAM! Amber and I were jumping up and down in the courtyard outside. It was worth all the hours that had been put into waiting for this moment. I will probably never have signing lines 1700 people long. Poor Neil has had to forego any signing tours in the future (he’ll still do speaking tours) because of the sheer number of people that turn up for his autograph. I cannot imagine sitting there for countless hours and having to be On for every person that comes through, who have driven and waited hours to see you. Neil’s energy and generosity were an amazing inspiration for the future, and I’m calling the whole thing a Very, Very Good Omen. In other news, I’m working on a new book. The idea has been percolating for over a year, and I’ve had a pinterest board for it since around that time as well, but serious progress wasn’t made until a few weeks ago, and now I’m pretty confident in saying it’s marching forward steadily. The working title is The Cobworld. I’m trying out some things I’ve never done before, with this book. Stuff like having both parents alive and present in the storyline, or trying to do all the world-building and plotting before I really start pounding away. At the same time, I am reminded of an analogy Laini Taylor made once, in which she compares stories to a house: When you’re doing all the planning, it’s like standing outside the house looking in. Yes, you can see some things, and you know the general shape. You know if there’s an upstairs, and if there’s a back porch, etc. But you don’t really know a house until you get inside it and start moving around, and that’s where the actual writing part comes in. You can plan and imagine all you like, but the house could be very different once you enter it. Ahh!!!! There are so many good things in this post. Non-absentee parents, new writing, good things for ACORAS, meeitng Neil Gaiman, BFFs, so much awesome. I am so happy you’re having so many little successes lately AND if the trade-off is creativity going into writing I totally approve of the transition to a hate-crafting blog. You can be all snarky about crafting and everything. Crafting after a few glasses of wine right? OMG yes! I’ll call it My Drunk Craftroom! !